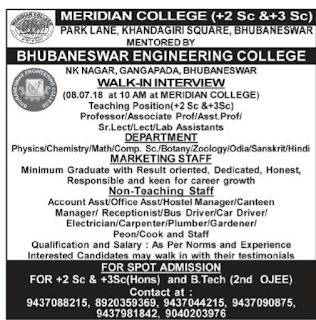 Meridian College(+2 Sc, & +3Sc), Bhubaneswar has advertised in the SAMAJA newspaper for recruitment of Teaching Faculty- Lecturer, Assistant Professor, Associate Professor,Professor, Non Teaching Faculty jobs vacancies. Interested and eligible job aspirants are requested to attend walk-in interview on 8th July 2018. Check out further more details below. 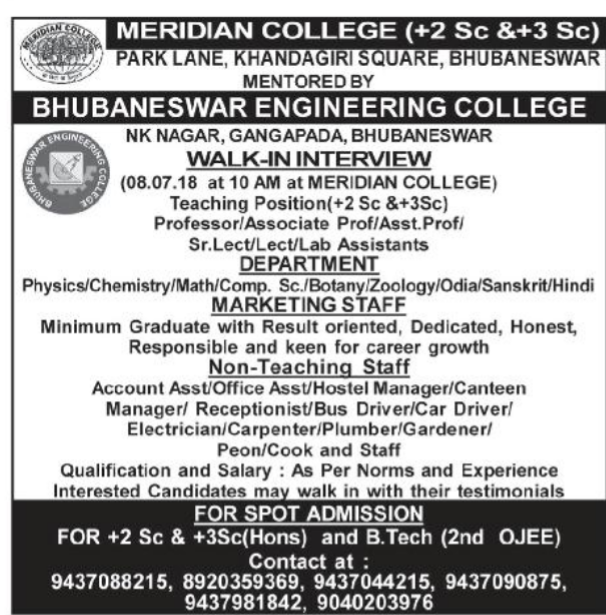 Name of the College : Meridian College(+2 Sc, & +3Sc), Bhubaneswar. About College: Meridian College’s goal is to initiate in its students a love of and respect for learning, to help them develop self-discipline, and to encourage creativity. We endeavor to promote an educated and honorable citizen with a command of facts and a mastery of the English language, capable of rational thought, of unequivocal self-expression, and of taking full advantage of any growth-promoting opportunities in life. As per norms and experience. How to Apply: Interested candidates may walk in with their testimonials. Reference: Recruitment Notification / Career Job Opportunities notice for Teaching Faculty - Lecturer, Assistant Professor, Associate Professor, Professor, non teaching faculty on Samaja newspaper Dated 2nd July 2018.